Here's my favorite "find" of the year so far. While high-quality albums from known quantities are always appreciated, there's nothing like discovering great music from someone you've never heard of. Harris is a definitely a pop craftsman first class, and this is an assured full-length debut for the singer-songwriter from Durham, North Carolina. The infectious "I Found Out" sounds like a combination of David Grahame and Jeff Lynne, "Mansfield" is a bouncy piano-based number with some brass backing and a 70s pop sheen, "Drop the Needle" is a Beatlesque ballad, and "So Easy" would be a hit in a parallel universe where melody still ruled the charts. Plus, it's a good sign when the last three songs are as good as the first three: "Too Late" is another midtempo winner, the title track is fine ramshackle pop, and closer "Over and Over" is a wonderful jazz-tinged number you could see someone playing in a cocktail lounge. 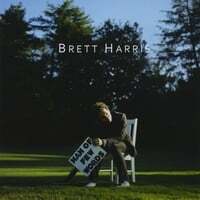 While Harris may be a man of few words, here's hoping he isn't a man of few albums. Good rec. Excellent album. Keep up the good work. Thanks.